Last week, shares of Amazon (NASDAQ:AMZN) stock briefly broke past the $1800 level before dropping back down again. This comes after Amazon stock has added over 31%, since making lows at $1344 on Christmas Eve. While AMZN had clearly gotten oversold to end last year, in a similar fashion shares are now getting overbought to start 2019. Look for the red hot rally in Amazon to cool now that the momentum has broken. Any discussion of Amazon stock from a purely fundamental standpoint is ludicrous at best. AMZN trades on belief and momentum. A comparative fundamental look, however, can be insightful. I prefer the price-to-sales ratio rather than the more widely followed P/E ratio to get a cleaner look. On this basis, AMZN stock is getting rather pricey again, with a reading approaching 4. Click to EnlargeAmazon stock is looking decidedly overbought from a technical perspective. 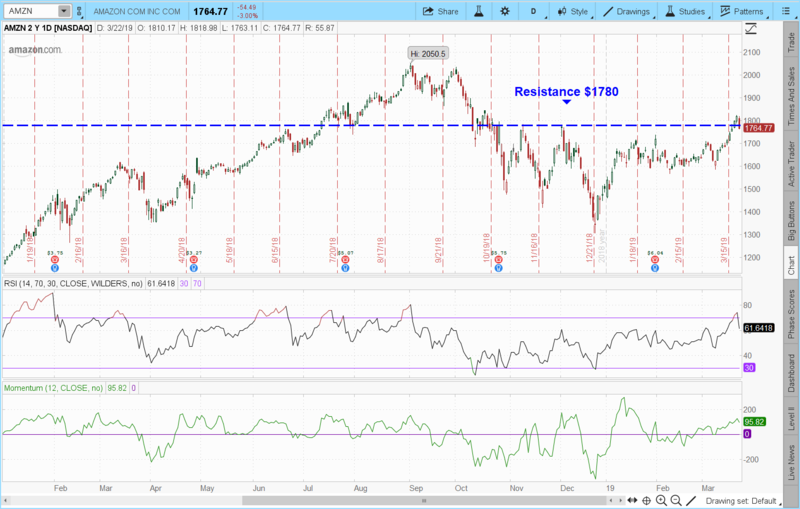 AMZN reached a 14-day RSI reading well over 70 before weakening over the past few days. The last time Amazon stock was so overbought on this metric marked the all-time high in AMZN shares. Furthermore, momentum has waned and is heading lower. In each instance when this has happened before, it has led to a pullback in momentum to a neutral reading of zero –meaning there is more downside coming for Amazon stock. Most importantly, Amazon stock is back below the crucial $1780 resistance level after briefly piercing it. This marks the third successive failed breakout attempt for AMZN. This failure, especially after such a strong move higher, likely means the buyers have finally become exhausted. This is especially true given that Amazon stock had been up 8 out of the previous 9 days prior to Friday’s major reversal. Traders should look to short Amazon stock any time a rally puts it back toward the $1780 area. Earnings are due May 2, so consider closing out the trade prior to that date to avoid earnings-related risk. A meaningful break past the recent intra-day high of $1823.75 would be a viable stop out. Option traders may elect to sell the April $1855 calls and buy the April $1850 calls for a $1.00 net credit. Maximum gain is $100 per spread with maximum risk of $400. Return on risk is 25%. The $1850 short strike price provides a 4.8% upside cushion to the $1764.77 closing price of Amazon stock. Article printed from InvestorPlace Media, https://investorplace.com/2019/03/1780-is-the-number-to-watch-for-amazon-stock/.